Now the World Cup is over, some of you might be suffering withdrawal symptoms, others may be glad they don't have to watch any football for a whole month. But on 1st September, when the leagues are all well underway again, both sides of that equation might fancy coming together to watch a documentary about footballing underdogs. 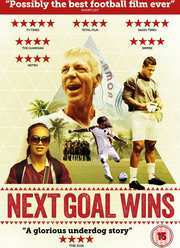 Out on DVD is the Mike Brett and Steve Jamison directed Next Goal Wins, arriving courtesy of Icon Entertainment. With a runtime of 94 minutes, 5.1 Dolby Digital soundtrack and extras that include a Singing in Pago featurette, Learn the National Anthem featurette, director's Q&A, Cooking the Samoan Way featurette and Thomas Rallies the Troops featurette, the recommended retail price will be £15.99. In 2001, the tiny Pacific island of American Samoa suffered a world record 31-0 defeat at the hands of Australia, garnering headlines across the world as the worst football team on the planet. A decade after that humiliating night, they remain rooted to the bottom of FIFA’s World rankings, having scored only twice in seventeen years. Against this backdrop of serial underachievement, the team face the daunting prospect of a qualification campaign for the upcoming 2014 World Cup in Brazil. It would take a miracle-maker or a madman to turn the team’s fortunes around – and in maverick Dutch coach Thomas Rongen the islanders somehow find both. A film for non-football lovers and football fans alike, NEXT GOAL WINS is a classic underdog story set amongst the beauty and tribal magic of the South Pacific. Giving a unique insight in to the Samoan way of life, the film brims with infectious personalities, not least the stunning, six-foot centre-half, Jaiyah, the world’s first professional transgender footballer, and Thomas Rongen the brash outspoken high-level coach who undergoes a remarkable epiphany.